It contains premium coffee, high-quality tallow rendered in house for freshness and quality control, and other carefully selected ingredients to aid in sloughing off dull skin to reveal a fresh rejuvenated complexion. 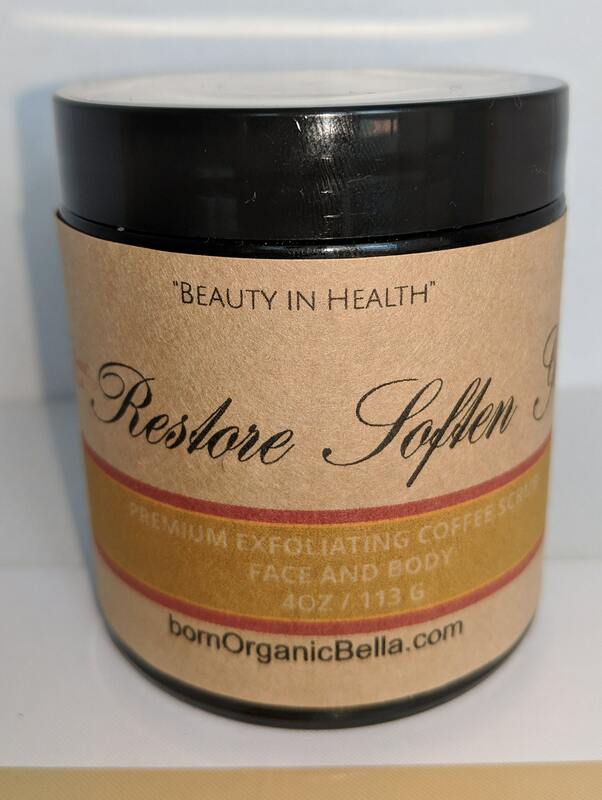 We purposely sourced finely ground coffee for gentle non-abrasive exfoliation to reveal glowing skin. All of our butters are packaged in glass jars which makes them naturally heavier than plastic. Please note that all items are shipped via USPS and will reflect current shipping charges via priority mail. If for any reason, the amount you paid in shipping exceeds the actual shipping charge, a refund for the difference will be issued back to you. Due to the nature of our products (not having toxic synthetic, emulsifiers, stabilizers, etc) All shipping will take place on Monday and Tuesday during the spring and summer months so that what we make will be exactly (or as humanly close as possible to what you receive in terms of texture.) I do not want to ship with the weekend so close and risk your precious cargo being left in the heat of a mail truck or mail warehouse. It will not change the effectiveness AT ALL. It’s like a chocolate bar melting in the heat. You technically can still eat it, and it will be just as delicious but it’s a melted mess. I don’t want anyone receiving a melted mess. Unless you don't care and insist... I get it, I am excited about using bornOrganicBella too!! Some states may not have to deal with extreme heat but be reminded that your bornOrganicBella purchase is coming from "Sunny South Florida". For sanitary reasons, items are non-refundable. If there is a problem do not hesitate to contact us so that we can try to make it right. Why dont we offer a conventional moisterizer or any liquid base products? We could’ve made a conventional moisturizer but chose to stick with the integrity of our mission to be 100% synthetic free. In order to be able to offer a conventional moisturizer we would’ve had to include a synthetic preservative amongst other synthetic ingredients. After much research, we decided against using a synthetic preservative. We didn't think it was necessary since you can get the same results or better with the 2 step method of applying your liquid of choice first then a butter without the use of synthetics. Besides, we know that most of our customers are their own "kitchen beauticians" and we decided to leave the option of using your own natural everyday liquids such as water to use at your leisure for your moisture needs. Not using a synthetic preservative means that we cannot sale anything with a liquid base. Liquids, such as aloe vera juice, spoil quicker and like water, are perfect environments for germs to grow without the use of synthetic preservatives or refrigeration. Besides, not offering a liquid based product means that you will get the highest concentration of selected ingredients and not some watered down moisturizer. A little will go a long way. Furthermore, it allows an effective approach in keeping with the integrity of our product & mission in being 100% synthetic free. We hold true to the belief that most nature made ingredients aren't made to last forever. We believe that this cycle of nature keeps us on our toes, ensuring that we use fresh ingredients at a time when they deliver the most beneficial properties to our hair and skin. Why does shipping seem so high? Q. Why do you only ship Monday-Wednesday? A. None of our products have any synthetics so we are at the mercy of the weather when we ship. We hate that it starts as a yummy whipped butter but ends up melted and grainy. Thankfully, this does not change the effectiveness, but still it bothers us and we try our best to keep shipping cost as low as possible by not using some type of refrigerated shipping. This may change but we will give you the option to use this upgraded shipping or not. We ship Monday through Wednesday to minimize the amount of time products are sitting in a truck or warehouse on a weekend when postal services are closed. Q. Why do your products seem so expensive? Q. I can make this myself, why should I pay so much for your stuff? A. You should only do what you wanna do with your heard earned money. It’s true, you can (try to) make it yourself. Be our guest. If you can do what we have been working at since 2011, go for it! Most people pay for the convenience of the research and quality product already being done. And as stated above, you won’t find most of our ingredients at your local stores and you definitely don’t have our recipes. We are bornOrganicBella, a cut above the rest. Q. My products arrived melted, what should I do? A. Simply remix and use. Unfortunately, we are at the mercy of the weather when we ship. We hate that it starts as a yummy whipped butter but sometimes ends up melted and grainy. It’s like chocolate, it’s yummy melted or in a bar. Thankfully, this does not change the effectiveness, but still, it bothers us and we try our best to keep shipping cost as low as possible by not using some type of refrigerated shipping. This may change but we will give you the option to use this upgraded shipping or not. We ship Monday through Wednesday to minimize the amount of time products are sitting in a truck or warehouse on a weekend when postal services are closed.